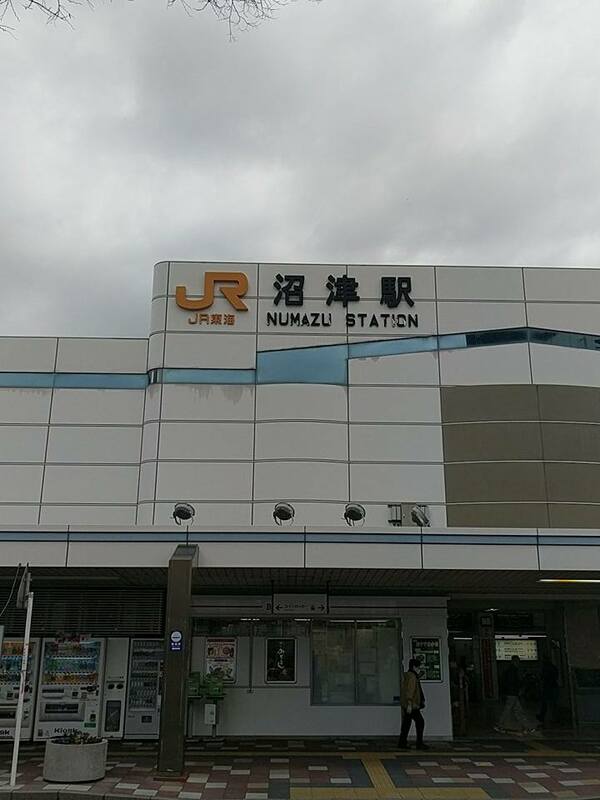 A Pilgrimage to Numazu and Uchiura — Oh no, Anime! Hey everyone, it's been a while so I decided to check in from my Japan trip with an article about my day trip to the location of Love Live Sunshine: Numazu and Uchiura! It was a pretty awesome trip and I was amazed at just how into it the cities are, to say nothing of the amount of people taking the pilgrimage in the middle of the day on a Wednesday! I started my day from Awajicho station, right outside of where I'm staying. Tokyo station is just two stops on the Marunouchi line so I'm pretty central to everything. From Tokyo Station the plan was to take a limited express train to the end of the line in Atami, transfer to the local Tokaido line to Numazu, then take a bus to Uchiura! All in all a pretty lengthy trip but plotting this all out was some fun in and of itself... the trip is long enough that Google Maps, how I normally get around, says "screw you take a shinkansen" and I wasn't about that life. Big ups to the website Hyperdia for helping me out here, I would have been lost without it. Literally. The trip itself was pretty lengthy, just over 2 hours to get to Uchiura! The ride over was pretty fun though, it rides the coast through Yokohama, cutting north of Kamakura and giving you some awesome views of both the shore and the mountains around Hakone. The Yowapeda fan in me recognized quite a few of the routes they take in the show! Numazu station looked exactly like the show! But that wasn't where my goals were today. The locales are split pretty evenly with the first years having scenes in Numazu, the second years in Uchiura, and the third years on Awashima, an island connected to Uchiura by ferry. My goal for the day was in Uchiura, so off I was to find the correct bus! This was the first time I'd actually ridden a bus in Japan so I was worried I'd be able to find the proper one - there were 8 bus stops all in a circle and my map didn't tell me which was which! Luckily, the city of Numazu had my back on this one! This was a pretty big recurring theme - both Numazu and Uchiura are relying on tourism money from Love Live these days and it shows! The ride down was pretty uneventful but I had to notice that there were only two types of people on the bus: either you were over the age of 60 or you were there for Love Live, no exceptions! The town of Uchiura itself was pretty much the same. The first real landmark I noticed on the way down was the Awashima hotel, much to the delight of the Mari fan sitting in front of me! I think she almost gave her boyfriend a concussion from slapping him to wake him up and point! I took a small video of the hotel from the window of the bus and you can view it at this link. It was all I could do to not mimic Mami in her helicopter with a NI NEN BUuUuURI DESS! Right across from the inn is Mito beach, the place where Riko and Chika meet, and the place where they decide on the name Aqours after seeing it written in the sand. I pretty much decided to take this trip on a whim, I was not at all ready for the emotional impact seeing it would have on me. The area looks exactly like it does in the anime, and, of course, the word Aqours has been written in the sand, recently. I look farther down and see it's been written several times, and it's freshly lowtide. As I'm soaking the scene in, another pilgrim comes up behind me and wordlessly offers me a stick to write in the sand with myself. I handed the same stick off to the next group that came by. I was there enjoying the scene for maybe 20 minutes, and in that time no less than 8 people came by, from at least 4 different countries. On dreary Wednesday to a small fishing town on the coast of Japan, thanks to Love Live. Idols are something special. After I was done crying collected myself I headed back the other direction to Mito Sea Paradise, a cutesy little aquarium, and the location for the Koi ni Naritai Aquarium music video! It was a pretty standard aquarium, aside from all of the Love Live stuff anyway. The highlight for me was their massive walrus, Seiuchi, who's the inspiration for their mascot, Ucchichi! The aquarium itself also had a dolphin show among other regular aquarium attractions... like fish tanks. The gift shop was pretty dang great, and really big when considering the size of the whole facility. They sold a lot of Love Live goods, of course, but most importantly they sold plushies of all the girl's image animals! I didn't even know they had image animals! Yohane gets her coelacanth, Chika gets her weird trilobite, Dia her penguin, etc etc. I, however, had ascended and went straight for the Uchicchi merch! He was the real star of the music video. Unfortunately there wasn't very much Mito Sea specific merch - the only thing I found was a simple pin that mimicked the art from this stop on the stamp rally. Exiting the aquarium I ran into one of the special buses! Unfortunately I was only able to take pictures of one side of the bus before it drove off, but it was a really cool wrap, and the seiyuu had even signed the danged thing! Because I missed the bus it also meant I had to walk to the next point, up back the path a bit to the Marine Park, the point where the ferry between Uchiura and Awashima boards. I'm glad I missed the bus though, because had I taken it I would have missed all the tiny shops and inns repping Love Live on the way! My favorite of these was a tiny snack shop that was very proud that some of the girls had sat on the bench outside, even if it was in an anime world. The shopkeep saw me creeping outside and invited me in, where there was even more fun Love Live stuff waiting! Most importantly, this was one of the few shops that sold Noppo Pan, the giraffe-themed long bread that Hanamaru can be seen munching on in several episodes. It was delicious! The next stop on my trip was Marine Park to hop onto Awashima, the 3rd year island! Unfortunately, due to missing the earlier bus, I was awfully short on daylight so I opted to just watch it from afar. In this picture (click for larger) you can see the Love Live themed ferry along with Mari's hotel in the background. On the left, just out of shop, is Kanan's diving shop! In real life, as it turns out, it's a frog museum. While watching the boats come and go the bus finally came to pick me up and head back to Numazu proper. I didn't have much time to waste before the long trip back to Tokyo but I was able to find the Numazu Gamer's location. Gamers is a big chain in Japan specializing in anime and games goods, and wouldn't you know it? Yohane has completely taken this one over! Along with her takeover came turning over half the store into a Love Live Sunshine merchandise stop... I don't think anyone minds her butting in, actually. That store marked the end of my time in the area. All in all it was very enjoyable, definitely worth the long trip there and back. I do wish I had had more time to enjoy Awashima and maybe stay in one of the themed inns - I hear Chika's is pretty damn swanky, even serving cocktails based on the girls!